Spokane International Airport has relied on the team at PMG for years to deliver exceptional, world-class campaign creative, paid social and co-branded advertising campaigns with the major airlines. The team at PMG manages the media buys and campaign creation and optimization for the airport’s paid social campaigns advertising non-stop routes on the major airlines. From campaign conceptions and demographic targeting strategies, to campaign setup, execution and optimization, our team is the go-to partner for the airport. From advertising campaign concepts, messaging and digital creative, to outdoor advertising and media buys, our team offers full-spectrum campaign management support for the international airport. Developed a creative marketing campaign to promote the seasonal nonstop flight from Spokane to Anchorage on Alaska Airlines. Campaign included the creative design and placement of digital and print ads, outdoor and vehicle graphics. 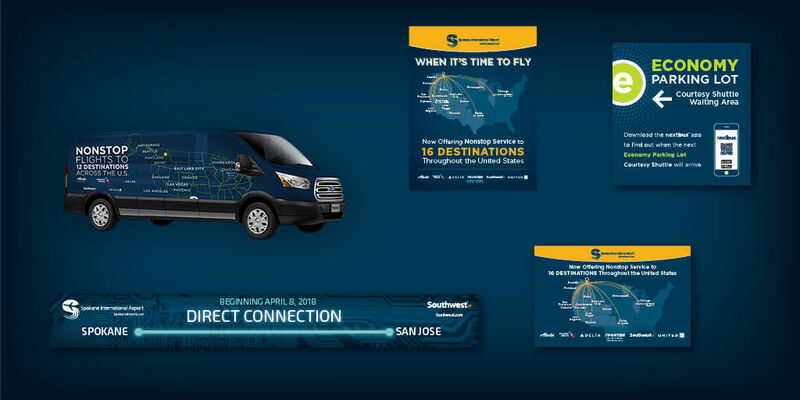 Developed a creative campaign that used both still images and GIFs to appeal to the best of Chicago, San Francisco and Spokane to increase travel on United’s nonstop flight. Quick daily flights encouraged leisure travelers to “reboot” and relax on quick weekend getaways. The campaign was designed around Facebook social ads targeted to demographic, purchase behavior and leisure activity interest parameters. PMG ideated, developed, executed, managed and optimized the campaign and the media buy through Facebook Ads Manager. Developed a creative campaign that used both still images and GIFs to appeal to the best of Dallas and Spokane to increase travel on American’s nonstop flight. Quick daily flights encouraged leisure travelers to “reboot” and relax on quick weekend getaways. The campaign was designed around Facebook social ads targeted to demographic, purchase behavior and leisure activity interest parameters. PMG ideated, developed, executed, managed and optimized the campaign and the media buy through Facebook Ads Manager. Researched, scheduled and placed a 6-month advertising campaign promoting the new round-trip nonstop flight from Spokane to Dallas on American Airlines. Campaign included a digital schedule with OTAs and ad networks, paid social on twitter and Facebook, outdoor and radio. Developed a creative campaign that captured the best of L.A. and the best Spokane to increase travel on Delta’s nonstop flight. Quick daily flights encouraged business travelers to take the meeting and be home before bedtime. The campaign included a digital media spend through a group of OTAs. ”PMG has created and executed a number of digital and social campaigns for us. Not only are they eye-catching, each campaign has consistently garnered higher than average engagement analytics. It’s more than just great click-through rates, it’s who we want to reach.